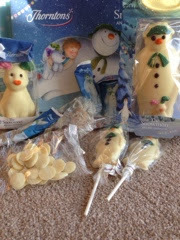 We all love a bit of chocolate at Christmas and now I'm pregnant I've not needed any excuse to indulge because I'm allowed...ok! Well...excited doesn't cover it really. Everything arrived perfectly packed and I just know my little girl is going to love this cute white dog (she's obsessed with anything dog related). So this ones hers...although mummy may have a nibble on those ears. 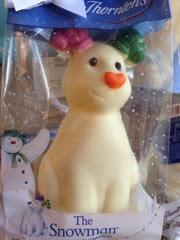 The other person in my life who could be described as a chocoholic is my Hubby. 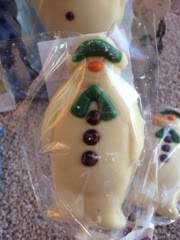 He's had a tough year and the snowman is his (as are the buttons and small snowmen on sticks). 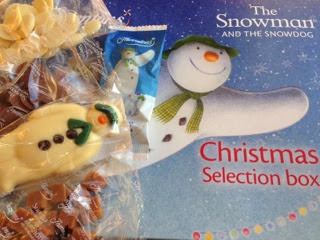 Now the Selection box we received was right up my street. 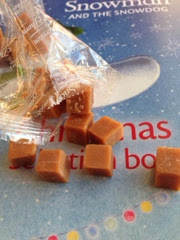 One of my biggest weaknesses is fudge (second only to chips!) so obvs I had to open the packet and photograph them and then taste them! All!! They were beyond superb and unfortunately I got called out on this when I visited the midwife later in the day. She did the dip test and asked if I'd had anything sweet. Now they are monitoring my sugar levels a bit closer although this particular sugar rush was all fudge and very much worth it (oh how I enjoyed them whilst Bubba was having a nap and I don't even feel bad about not sharing...that's how good they were). 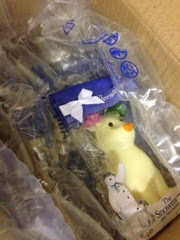 The selection box is a good mix of white and milk chocolate bits and would make a great present. I always get a selection box at Christmas. If you haven't got the last bits and pieces for your loved ones then get moving, you know what to do...Christmas gifts here at Thorntons. Win a Winter Wonderland Holiday in Magical Lapland with Thomas Cook - Take your family on a 3-night magical holiday to Lapland, inspired by the Snowman™ and the Snowdog, in December 2014!